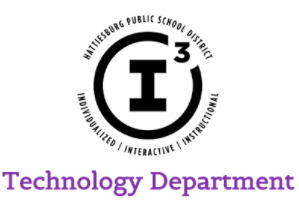 Dr. Will Deyamport, Instructional Technology Specialist, Hattiesburg Public School District, Mississippi, and founder of The Dr. Will Show. The Dr. Will Show is a podcast dedicated to driving the conversation of what it means to go digital. Each episode features an educator at the forefront of teaching, coaching, and leadership. I’ve known Dr. Will for several years and always reach out to him to learn more about different technology tools. I have been very fortunate to be on his show. Because of his extensive work with coaching and leadership, he just knows how to make his guests comfortable. 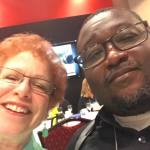 I have several selfies at different conferences with Dr. Will so added one here. I really enjoyed our conversation and hope you will too. Can you share about your background, your story, and your wife? I kind of fell into Instructional Technology by divine intervention. I was actually Chief Social Strategist for a coaching company. 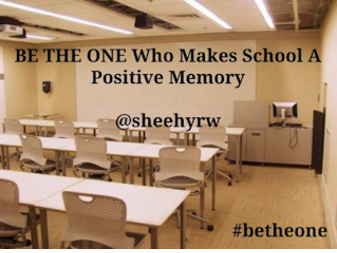 I was making videos and coaching people when Eric Sheninger came to our state to an ISTE Affiliate Conference in 2013. Right before he did his keynote, he said that he has a friend here who is an expert in Google. He said my name so I did the Miss America wave to everybody. After his keynote, I talked to the tech director at Hattiesburg School District who then gave me a job. 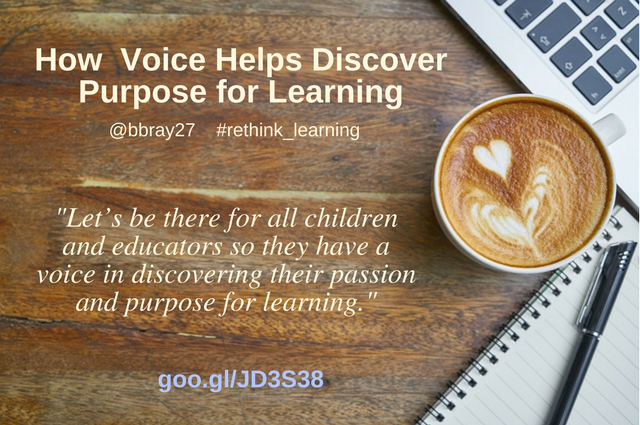 Why are you so passionate about going on this journey to transform learning? I am so passionate about transforming learning because of Twitter and at conferences. So many people are talking about 21st-century learning. and I hate that term with a passion because we are knee deep in the 21st century. The 21st century isn’t tomorrow, next week, or two years from now. It is now. We are talking about modern learning. When I look at the technology, I was able to bring the world to the students. For example, we are a rural district in Mississippi, but if you use Google Hangouts or Skype, you can bring in NASA, students, professors, and others from Africa or Brazil into your classroom. Students are being connected and learning in ways that, quite honestly, we never thought of 15 or 20 years ago. I love how students can take ownership of their learning and provide avenues to go deeper into their learning. Also, I’m passionate about technology and how digital is transforming at a phenomenal rate outside of education. Our students need to have the types of skills, creativity, and passion to compete. I’ve seen Tom Murray speak in person. He mentioned, “Have you seen a Blockbuster lately?” They’re gone. That’s what I think about when I want to talk to my teachers. I tell them, “I want you to be transformative before the transformation is upon you and you have no choice.” I want teachers to take ownership and define their why. I want teachers to get excited about what they can do and not feel like it’s just another thing the principal tells them or another thing to do. I want them to wake up in the morning, be rejuvenated and understand how their teacher can be the best they can be with technology. I know your job is Instructional Technology Specialist. Can you share your district, your responsibilities, and boast a little about what’s happening in your district since you started there in 2013? We are still seeing some teachers that want the chalkboard back because that’s what they know and feel comfortable with. That’s also how they were taught to teach. But we are seeing those teachers that are letting go and allowing their students to drive their own learning. I always bring this up in every interview I do. I talk about Mrs.Desshondra Walker, my general. When I talk about technology to teachers, she can come from behind me and say what needs to be said, and then they are onboard. I love what she does in the classroom. She puts her students in groups of five and tells them that they are going to teach each other a lesson. The students do it and use NearPod, Google apps, and Quizlet Live to teach other. Then she goes behind after that to see what’s going on and finds that it’s time for her to jump into drive this thing. She is able to get that quick feedback from students using these tools to see if they are understanding the concepts. Then if they are having problems, she can use NearPod and put in some new slides with the concepts they are having trouble with to reteach it. I love what she’s doing. Her kids are making videos as well. Other teachers are moving forward and using technology to make teaching and learning easier and more effective. When teachers walk up to me and say “I did this. Come to my class.” That makes those days worth it. You are going to be the first to hear this, but we are going to start a podcast interviewing teachers about their practice. You mention that you are a coach. Can you elaborate on that? 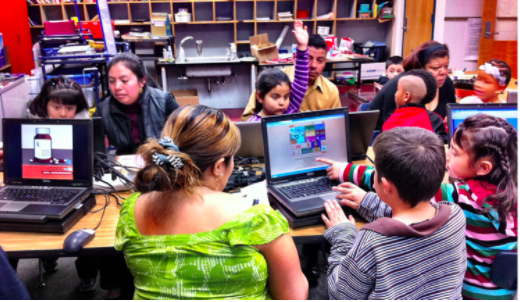 Can you share any tips to encourage blended and deeper learning? What I try to do is take time to sit back. Technology integration took time to grow. There were times they weren’t using the technology, and it was ticking me off. I would see them making a thousand copies a week. They would see me coming and say, “here he comes again.” If this initiative was going to succeed, I cannot drive it. They have to take ownership and define their why. I am here to coach and look at their strengths as well. 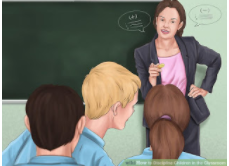 So when I talked to teachers, I asked them “what do you want to do?” When I found a teacher that was good at direct instruction, I showed them Screencastify or Explain Everything so they would do what they do best with technology. We then could put those videos in Schoology to be used for guided practice, remediation, or for review. The bonus is that instead of a commercial video or Khan Academy, their students are getting them. This does not take away or change what they do but enhances it. If teachers are strong at projects, then I asked them what can we do to help you. If they are strong at something else, I’m there for them. As a coach, I work with them to bring out the best of them with what they are already doing. Then everything started to take off and the pressure came off of me. My job and my spirit became lighter. It wasn’t me trying to push them. They were driving the train. Can you share when and why you started the Dr. Will Show? I started the show three years ago. The impetus for the show came from my experience as the Chief Social Strategist at TaleeUp and also to provide content in that space. I don’t like to write and blogging for me is just not something I enjoy doing much. I enjoy engaging people and saw podcasts on YouTube, so I thought why not do that. Every now and then I would be hit by inspiration and write a blog. I know that if you want to engage people, you need consistent content that your followers can rely on and look forward to seeing. So I wanted to revise the whole idea of a podcast. I also have been revising how I do the podcasts, my style and footing. I just recently reviewed some of my earlier podcasts and realized they weren’t very good. But now I’m happier with what I’m doing and hope they grow and expand further. I had to sit back and find my groove on how much to say versus how much to let them speak. At first, it seemed robotic and went by so fast. You and Kathleen were the ones who asked for questions in advance and I learned from that. Once I started creating the questions up front, it allowed me the flexibility to be more conversational. You connect the connected. Can you share how you use social media and how educators can connect on social media? Twitter rocks! I’m a proponent because academically I’m an expert. I wrote my dissertation on teachers using a Twitter supported Personal Learning Network (PLN) for Professional Development. I did the research and conducted a study. 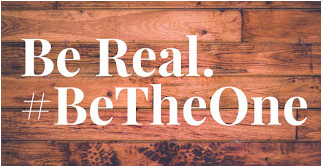 For me personally, I love how individualizing your PLN and personalizing your professional development helps you build your tribe. You are only limited by your imagination. I follow a lot of people on Twitter who are Instructional and Technology Specialists, but I also follow teachers, people in business, coaches, writers and many others. Their information contributes to the work I do and I’m able to synthesize those ideas to use and share. It has been very rewarding for me. The downside is when you first get in you have to be able to network, and that takes time. If you’re not ready to put in the time, it can become frustrating. I had people in my study where some teachers said that they put out a tweet and no one replied. I told them that no one knows them because they are new. I told them to tweet to someone specifically and use a hashtag. If you don’t have any followers, it is like throwing something into the woods and saying “can anyone help me?” There was no one around. They don’t know you are there so no one is going to respond to you. Don’t get on Twitter to just get on Twitter. Find a specific WHY you’re there. It fit is just to learn more about Google apps, then start from there. It is all about the relationships, not the numbers of followers. Put in the work to engage to build the relationships. I try to present at conferences on it and talk about it on webinars and podcasts. I want teachers to become connected. We’re on Twitter. We get it. We forget that so many teachers are not on it. Part of my work is to get people connected and to get them to understand that being on Twitter it doesn’t matter your zip code, country, you can learn from anyone. 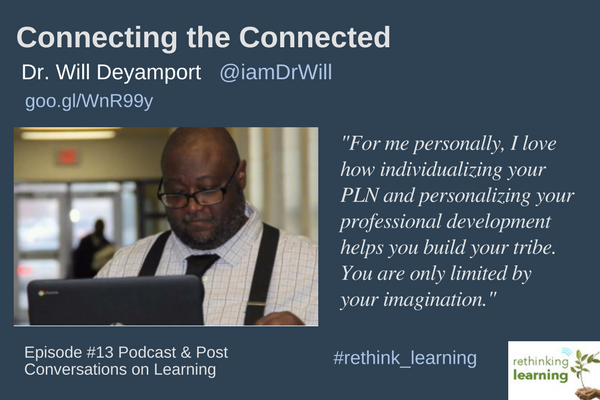 Dr. Will Deyamport, III is a globally recognized Connected Educator and Connected Ed Consultant. Motivated by his passion for education and digital media, he has been able to leverage the use of social technologies in the classroom to enhance the learning experiences of people worldwide. Dr. Deyamport’s professional journey in digital learning first began in his teaching the educational applications of going digital as the Campus Outreach Coordinator for CAREEREALISMcampus.com. Later he became the Chief Social Strategist for Your Type Advantage, where his leading-edge expertise was used to build and manage a compelling and comprehensive social strategy and narrative for the continued growth and development of the company’s Ning and digital brand. 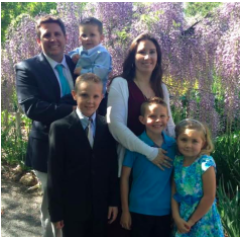 Dr. Deyamport earned his Doctor of Education (Ed.D.) in Educational Leadership and Management from Capella University with a research focus in Digital Leadership and teachers using a Twitter-supported personal learning network (PLN) to individualize their professional development. Currently, Dr. Deyamport coaches and assists educators in the discovery and classroom implementation of an array of technologies such as GAFE, web tools, Schoology, etc. He is a huge proponent of creating engaging, collaborative and interactive learning experiences focused on the use of web technologies to aid in differentiated instruction and connecting students to a global community. Dr. Deyamport has created The Dr. Will Show which is a podcast dedicated to informational dialogue and discussions with educators about a myriad of topics related to education. Most recently, he partnered with a dynamic group of amazing educators who organized the first EdCamp in Mississippi! 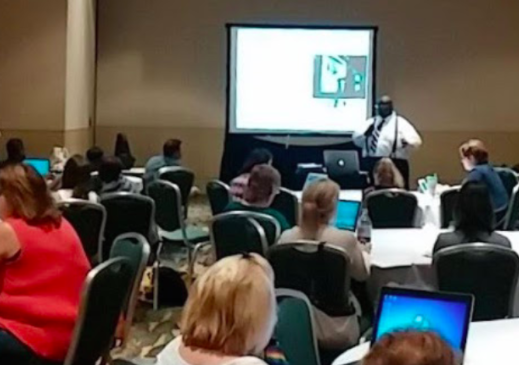 He was a co-presenter at ISTE 2015 and a featured presenter at Making Connections Conference. Dr. Deyamport is a 2015 Schoology Ambassador and contributor to The New Social Learning (2nd Edition). He was the Co-keynote speaker at T.G.I.F., hosted by Mississippi University for Women. His recognition, achievements, and accomplishments are an illustration of countless hours of commitment to helping fellow educators have a lasting impact on future generations. His love of and dedication to a connected, imaginative and exciting educational experience will continue to serve as a driving force behind the social educational trailblazer simply and affectionately known as Dr. Will. Architect Rosan Bosch designed the school to encourage both independent and collaborative work such as group projects and PBL. Even the furniture is meant to encourage learning. Bosch says each piece is meant to “aid students in engaging” while working. Instead of a classic classroom setup with desks and chairs, a giant iceberg with a cinema, a platform, and room for relaxation and recreation now accommodate many different types of learning situations. 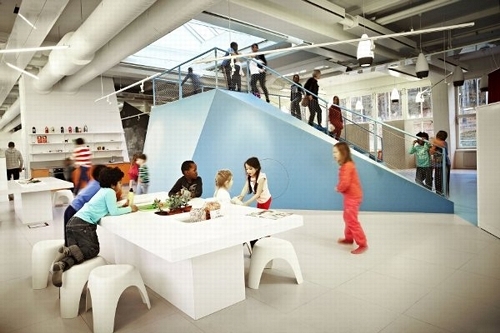 The Swedish free school organization Vittra’s new school in Stockholm has a physical design that promotes the organization’s educational methods and principles. 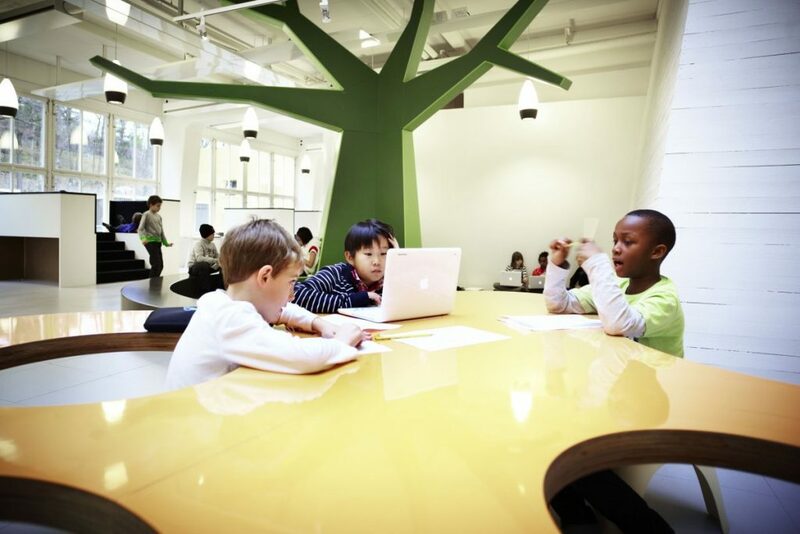 Vittra opened Telefonplan School, in Stockholm where Architect Rosan Bosch designed the school so children could work independently in opened-spaces while lounging, or go to “the village” to work on group projects. All of the furniture in the school, which looks like a lot of squiggles, is meant to aid learners in engaging in conversations while working on projects. The Cave – a space for private concentration to concentrate and enter an introspective process of communication with yourself. The Lab – fun with experimentation and practical work where you can discover and explore colors, shapes, and materials at different workshops using lab trolleys that make the labs flexible. 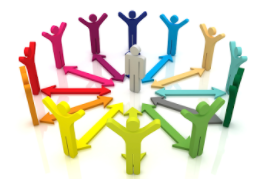 The Camp Fire – the group process is one of the most important learning situations because learning is a social process. Children need spaces for large as well as small groups. The groups don’t have to be in a closed off area but should be a space where the group can focus. The Watering Hole – a place for encounters and impulses as a living space full of activity where learners can drop in for a while and then move on. The Showoff – where learners can show off their progress and discoveries. A stage, a presentation, a drawing on the wall, a film or a blog – all ways of showing off their work. Vittra schools reach kindergarten through twelfth grades. So why do they say “schools without classrooms?” One thing is clear from Vittra is that opening the walls, moving furniture or changing the furniture and allowing flexible places encourages creativity. It works for all ages. The un-schoolness doesn’t stop with the furniture and layout. Children play and learn on the basis of their needs, curiosity, and inclination in the best ways possible. Children develop effective bilingualism in English and Swedish while experiencing and creating international contacts through networks and exchange programs abroad. The schools are non-traditional in every sense: there are no letter grades and learners learn in groups at their level, not necessarily by age. Admission to the school is free, as long as the child has a personal number (like a social security number) and one of the child’s parents is a Swedish taxpayer. The focal point of the school is its mighty “tree,” which serves as a meeting place for all students and unites the other elements in the school. 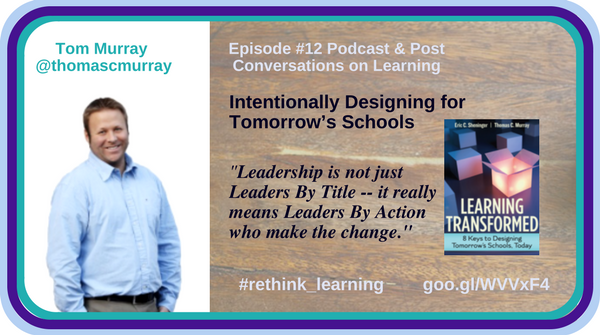 Tom Murray serves as the Director of Innovation for Future Ready Schools, a project of the Alliance for Excellent Education, located in Washington, D.C. and is co-author of the new ASCD book, Learning Transformed: 8 Keys to Designing Tomorrow’s Schools, Today. I’m fortunate to have met Tom and learn so much from his presentations and keynotes. 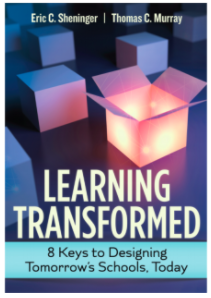 He sent me a copy of his and Eric Sheninger’s book, Learning Transformed for me to review. What a valuable book for schools! I feel so honored that Tom shared his journey to transform learning with me. Below are a few excerpts from the podcast, Tom’s contact information and a recent webinar with Tom and Eric. Can you share a little about you, your family, and your former life as a teacher and principal? My family is the reason why I do the work I do. When I do keynotes or presentations, I start with pictures of my family, my babies. My little girl, Paisley, is a second grader at a public school in Pennsylvania at a wonderful district, Parkland School District. My little boy just turned four. They are the lens that I do what I do. I look at what would I want for my own kids. If it’s good enough for my kids, it’s good for every kid. I’m not this 50,000-foot policy person that’s never done what I’m talking about trying to tell school leaders what to do. I spent 14 years in public schools in Pennsylvania first as a teacher, a number of years in 4th grade and taught middle school for a couple of years. I became a middle school principal and then an elementary school principal for three years. After that, I moved to the district office where I was the Director of Technology and Cyber Education. How did you and others start #edtechchat? You know #edchat was around along with other great Twitter chats and I was asked to guest moderate several chats talking about Ed Tech. About 5 years ago, I talked to Katrina Stevens @KatrinaStevens1, Susan Bearden @s_bearden, Sharon Plante @iplante, and Alex Podchasky @ajpodchaski on a Google Hangout one day where we asked, “what if we started a chat around Ed Tech?” We decided it was not for the purpose of talking just about tools or devices, but to focus on learning and the effective use of Ed Tech. On our first chat, we had no idea how many would join us and over 100 people showed up. Our team has expanded over the last few years with 9 or 10 of us running the chat. We’ve had guest moderators with people from superintendents to teachers and some like Arne Duncan which was his first Twitter chat to ever moderate when he was Secretary of Education. We avoid the sales pitch side of things because we want to talk about learning and hear from teachers and other educators. #edtechchat is on every Monday night from 8-9 EST and hope to see people there. Can you tell me about your work with Future Ready Schools? After 14 years at my district, I have been the Director of Innovation for Future Ready Schools for the past three years. I get to work with school leaders from coast to coast running events for hundreds of leaders encouraging them to network, collaborate and share best practices or it could be running leadership retreats or being at conferences where I often see you around the country. Under the scope of my role, I see schools in some of the poorest areas in our country and visit the urbanest areas. I’ve truly grown as an educator and learned as much in the last 3 years as I did in my first few years as a brand new teacher as well. What does it mean for a district to be Future Ready? The first two years for Future Ready were focused on district leadership because we always believed there were pockets of great things going on in schools. To scale the work, district leadership needs to be on board. There are over 3100 district superintendents representing over 21 million children who already signed our Future Ready pledge. Future Ready (futureready.org) just launched 5 strands this year. So now there are Future Ready Superintendents, Principals, Librarians, Instructional Technologists, and Instructional Coaches. Each of these strands has their own Facebook pages. A workshop for 10 to 15 principals is run by principals. Same for the other strands with people who have been there shaping the content and experiences to make it real for the participants. The idea is to move our schools forward with our kids at the heart and center of the decision-making. Eric and I are blessed to work not only in keynotes but closely in workshops with thousands of school leaders every year. We see the really hard issues they are struggling with that are on their plates. Some of those issues are equity, access, and even budget cuts. We wanted to put a book together that were the common themes and struggles we are seeing and where the schools are that are truly transforming learning. So you asked why we started with “A Sense of Urgency?” To create that compelling “WHY” and to put that hook out there. What is the need to transform? Part of the reason we did that is that it is easy to become myopic looking only in our building, school or district. Eric and I see the vast inequities that exist for places like our females in areas of STEM or opportunities for our students of color. Three things we considered in our book. (1) How do we handle all of those pieces? (2) We wanted to create an awareness of those issues. (3) Everything needed to be grounded in research with evidence. Schools tend to hop on the latest bandwagon and trend to spend all their money. Then they look back and see that it didn’t even do anything. We have to be better stewards of our spending, especially if is coming out of the taxpayer’s wallet. As leaders, we have an obligation to spend the taxpayer’s money well. But more importantly, we have to create really robust learning experiences for kids. Part of that sense of urgency is helping people understand what the world of work is projected to look like. My little girl going into second grade and will be in the high school graduating class of 2028. My little boy will be in the class of 2032. So what will the world of work look like in 2036 when my boy graduates from college. That’s almost 20 years from now. That’s the reality of the future for my family and that becomes really urgent for me. That’s my lens. But in our roles as educators, we need to create that sense of urgency to prepare all children for their world, their future. We have to look at what that world will look like for them. Eric and I referenced about 190 research reports to ground what we wrote in evidence. We wanted to provide research so learners can be successful in their future world of work. For example, they are projecting that there are 4-5 jobs today that pay under $20/hour that will eventually be automated. If those predictions come true, what happens to our economy and the people involved? What does that mean for the world of work? That’s where we need to focus on teaching and learning since we are shaping those students that will be leading that future. That’s truly why we have that sense of urgency. How do you take the evidence grounded in the WHY and compare it to traditional practice happening in your school or district? We found schools and superintendents with innovative practices in action (IPA) that back up what they are doing and aligning it to the research. We wanted to move from the evidence to the practice in every chapter. You mention intentionally designing for tomorrow’s schools. The 8 keys provide evidence-based practices and innovative ideas to provide a dynamic, blueprint for redefining student learning. Is that why Key #1 is Leadership and School Culture to lay the Foundation? We are very purposeful with leadership in schools and culture as setting the tone. 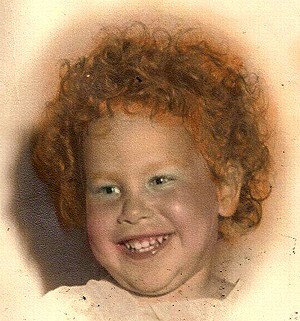 Eric and I have been in some of the poorest areas, in fact, I was in a place in Mississippi that was still on dial-up. Here’s the thing, we’ve seen some of the poorest areas do amazing dynamic things with kids. Why? Because of school leadership. Then we see other areas where they have more than enough technology but they are still teaching the way they used to teach years ago. There are kids who are compliant and play school really well so they do well in school. The difference comes down to leadership. I’ve never seen districts that do amazing things without dynamic leaders. Leadership may mean that the best leaders could be the 5th-grade teacher or a support staff member that are leading the way. It is not just LBT (Leaders By Title) — it really means Leaders By Action who make the change. Leadership and school culture lay that foundation. You can have the greatest plan but if you have a toxic school environment, it will fall apart. Another theme in our book that matters for culture is relationships. How do we form and cultivate those relationships? That is the heart and soul of transformation. I hope you listen to the entire podcast with Tom for the rest of our conversation. Tom is so passionate about transforming teaching and learning and that comes across in the podcast. This was an amazing opportunity for me to have this conversation with him about his and Eric’s amazing book. 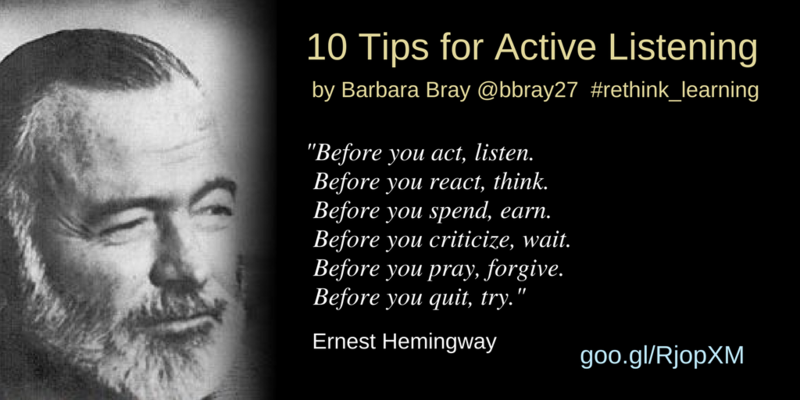 I captured excerpts of our conversation in the post above but there is more so don’t miss it. He continued to discuss information on student agency as a valuable component for the “Netflix Generation,” why it is important to avoid the “Cemetery Effect ” and design learner-centered environments and brought it all back to why we need to transform learning: it’s all about our kids. I highly recommend every educator who believes it is time to transform teaching and learning to read Learning Transformed. Tom Murray has testified before the United States Congress and works alongside that body, the US Senate, the White House, the US Department of Education and state departments of education, corporations, and school districts throughout the country to implement student-centered, personalized learning while helping to lead Future Ready Schools and Digital Learning Day. Murray serves as a regular conference keynote, was named the “2017 Education Thought Leader of the Year,” one of “20 to Watch” by NSBA in 2016, one of the top 20 thought leaders in education, and was named the “Education Policy Person of the Year” by the Academy of Arts and Sciences in 2015. His new book, Learning Transformed, co-authored with Eric Sheninger and published by ASCD, was released in June 2017. 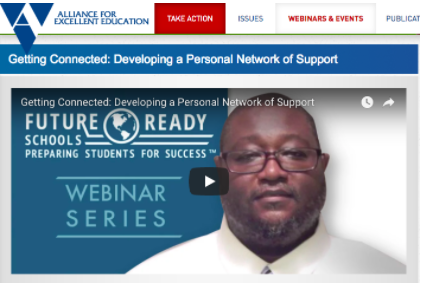 Register for one of the 2017 Future Ready Schools Regional Institutes! Randy Ziegenfuss, Ed.D. is Superintendent at Salisbury Township School District and Clinical Adjunct Professor at Moravian College in Pennsylvania. Randy is a blogger, speaker, and podcast host at TLTalk Radio and Shift Your Paradigm. I have known Randy for several years on social media and have been fortunate to be on his podcast show twice. When I met him in person at Educon last January, we had a great talk about the future of learning. I knew then he was going to keep pushing the edge with his co-host Lynn Fuini-Hetten, especially now with their new show, Shift the Paradigm. I was so excited that Randy agreed to join me on my podcast and below are excerpts from our conversation on learning. Can you share about you, your background, and your journey as superintendent of Salisbury Township School District? Yes, I am currently Superintendent of Salisbury Township School District in Pennsylvania. It was fun meeting you at Educon in Philadelphia last year. In fact, we’re located about an hour north of Philadelphia and 90 minutes to New York city. It’s a great place geographically being so close to cultural events. This is my 32nd year in education. My first 12 years I taught middle school music, general music, and musical theater. I was a music major in college. About 8 or 9 years into my teaching, this thing called a computer landed in my classroom. I got very curious about what I could do using computers for kids learning music. We were sequencing music and making all sorts of sounds. If you walked by my room, it was like a three-ring circus. Kids were doing all sorts of things connected to their interests and passions around music. During that time, I became interested in not only musical things but learning about technology. 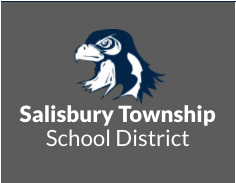 After 19 years in the school district next door, I moved to a more formal leadership position as the Director of Technology here at Salisbury Township and did that for six years. I have the pleasure of working with an amazing team of teachers, students, and parents. We accomplished a lot of things during that time. Back around 2006, there was one desktop PC for each instructional area. It was a pretty traditional school. Now we are a K-12 school district where every student has their own learning device which took a lot of planning, thinking, collaborating, and work to get there. 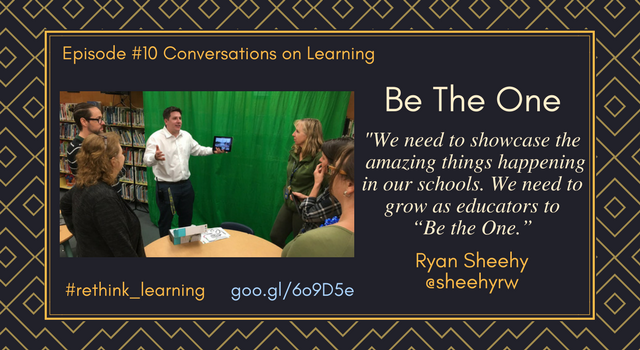 One thing I shared with Lynn Fuinehetten, my podcast collaborator and assistant superintendent here is that it has been an interesting journey to see how the conversations and the transformation really moved away from the technology to really focus on learning. Learning has changed and can change as a result of having access. Mission: Salisbury…Inspire, Think, Learn, Grow… Together! 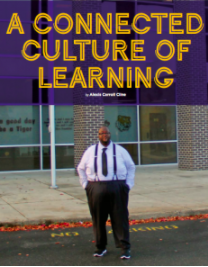 Can you share how you and your administration created a culture of learning? What knowledge, skills, and dispositions do our current learners need to have to be successful once they leave us? We call that life; not just focusing on a career, not just making money, not just being a good citizen, but just living a good life. 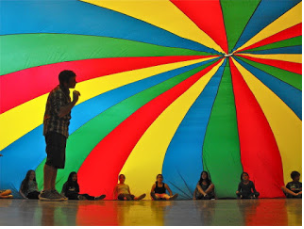 What kinds of learning environments are going to help us to help them best get there? What do we believe about learning not only for our children but across the organization? If we are all learners and all leaders, then all those things we believe about learning apply to all of us. Are these the questions you used to develop a progressive vision for teaching and learning in 2020, the Profile of a Graduate and Learning Beliefs? It’s been good to have those two questions and the work around the profile of the graduate and learning beliefs really ground what we do around here. The profile of the graduate is essentially our vision and our job is to provide the resources and support to help you get there. We want to empower our leaders and teachers to ask those questions and think deeply about those questions because they are not questions that are easily answered. Lynn and I met with our stakeholders on their turf. The stakeholders were our students, parents, teachers, leaders, and our community and asked them those questions. We then synthesized those in the profile of our graduate and the learning beliefs to help us get there. We had to create some action plans around a culture that model those learning beliefs and that empowers our teachers, our leaders, and our students to learn in a way we say powerful learning happens. We created professional development opportunities that really allowed our principals and teacher leadership teams to personalize their own learning journeys throughout the year that was tied to the profile of the graduate goals. What was really exciting and kind of frightening was we found that every school was not doing the same thing in the same way at the same time. Each principal and leadership team had the opportunity to identify the needs, the gaps, how to harness the strengths of the people within their school, and how to create something new to move them toward the goals. Each school is different and the work models our emphasis on personalization. Hope this gives you from a leadership perspective a background of Salisbury as a learning culture. We created professional development opportunities that really allowed our principals and teacher leadership teams to personalize their own learning journey throughout the year that was tied to the profile of the graduate goals. What was really exciting and kind of frightening was we found that every school was not doing the same thing in the same way at the same time. Each principal and leadership team had the opportunity to identify the needs, the gaps, how to harness the strengths of the people within their school, and how to create something new to move them toward the goals. Each school is different and the work models our emphasis on personalization. Hope this gives you from a leadership perspective a background of Salisbury as a learning culture. Can you share the background of TLTalkRadio with Lynn Fuinehetten? with Working at the Edge? Lynn and I wanted to model this idea of being learners. There was professional development focusing on pockets of innovation that was happening in districts. Mostly our conversations were with teachers who did project-based learning, personalized learning, genius hour, digital portfolios, etc. We decided to find educators and authors who were mostly curious and open to change like you and Kathleen. Lynn and I modeled the learning process by reaching out to you and others, reading your books, and having conversations with you. We hope to take an hour of your time and get inside your brain, understand your expertise and bring that back to our community. The podcasts, especially with authors, have been informing our practice. One person we interviewed was Education Reimagined’s Director, Kelly Young and that’s where we were exposed to the idea of the North Star that they have in their white paper. We dug into the lexicon around words and these ideas of not defining terms but defining the parameters. Then letting educators inside those parameters like a sandbox. How do they create their own understanding and possibilities out of setting those parameters? We became very interested this strategy in involving all of our stakeholders to adapt and tweak the five learning beliefs with some more refined statements, parameters, and boundaries. We wanted everyone to be involved in the design from a learner’s perspective instead of top-down decisions. Now you are sharing your learning and thinking on the Shift Your Paradigm Project. Can you tell me about the conversations and how you and Lynn make connections to practice? As we were having these conversations around the five elements of the North Star, we inquired about this idea of leadership. If we are to create these learning environments, what kind of leadership does that require? Reflecting on our own practice, Lynn and I came to the realization that we do have to behave differently as leaders with different mindsets and potentially different skills. 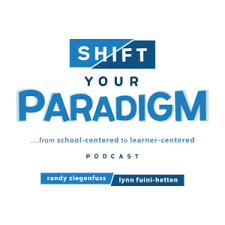 Shift Your Paradigm is designed to connect with leaders and learners from around the country who have created and are working on creating these kinds of learning environments. We try to get inside their heads to understand the ways in which they lead these kinds of learning cultures. That’s been a fascinating project and it’s really only begun with about nine episodes now. We expect this to be a pretty extended project, but ultimately, Lynn and I in the end really want to contribute something new to the conversation around re-imagining leadership through the learner-centered paradigm. I’d like to expand on the idea of building relationships. What do you think of taking the first two weeks to build culture before jumping into academics? One of the things we need to know about building relationships is that it takes time. I know so many school leaders that jump into quick solutions. You have to not be distracted by that. You have to be willing to put in the time to have conversations with people because it is a shifting of a mindset. In order to do that you have to build a relationship with that person or a group of people. Everybody needs to understand the intent and the way that you are approaching things. If you don’t put that time in, that’s when you might get something but it will not stick around or last. It hasn’t grown those roots or given it that time needed to take hold. I think that’s one of the things that is a little upsetting for our education community in general. There are a lot of ideas that are perceived as the silver bullet or the quick solution. Just read this book or follow this formula and then you will make it or it will happen and your life will be better. They can be great resources to start the conversations to get the thinking going. Every context is different. If you want to change the context, you have to have the conversations and believe those efforts will move you forward. There is no quick answer or silver bullet for any of our problems. If there was, then we wouldn’t be here wanting to shift the paradigm. That’s one of the things I struggle with. As a leader, how do we hold that “stuff” at arm’s length and say maybe there’s a value in that but let’s be very critical about what is that value. We need to allow the space and the time for people to figure that out. Connect with Randy on Twitter, the TLTalkRadio podcast, and the Shift Your Paradigm podcast! Randy Ziegenfuss, Ed.D. is Superintendent at Salisbury Township School District and Clinical Adjunct Professor at Moravian College in Pennsylvania. Randy is a blogger, speaker, and podcast host at TLTalk Radio and Shift the Paradigm. Randy is a life-long educator with 30 years of experience developing a passion for teaching, learning, leadership, technology and supporting the life-long learning of all students and staff. Strong background in developing and leading the implementation of a progressive vision for education, balancing increased opportunities for students with fiscal responsibility. Highly motivated by organizational challenges that involve new learning and problem-solving. Skilled at working collaboratively with a variety of stakeholders in the organization on small and large-scale projects, utilizing a data-informed stance to identify needs and take action to achieve goals. Accomplished educational professional with refined interpersonal and communications skills. The eBook 3 Key Principles of Digital Transformation.